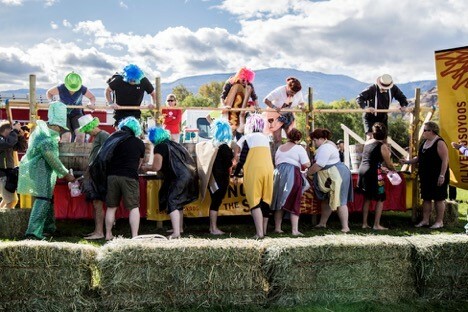 Highlight of the popular Festival of the Grape, held on Sunday September 30th in the Oliver Osoyoos Wine Country, the annual Grape Stomp draws attention from far and wide as participants fulfill their grape stomping dreams on stage, in front of a cheering 4,000 strong crowd. On Wednesday, June 20th at 9am, keen stompers can register to secure one of 24 coveted team spots to compete ($75 per team, includes festival entry, souvenir wine glass and three tasting tokens per guest). Space is extremely limited and the opportunity will sell out quickly. Hosted on stage during the Festival of the Grape, teams are encouraged to wear creative costumes as they go head-to-head in the ultimate grape stomping battle. Each team will be given a barrel containing 40 pounds of grapes, as they aim to stomp as many grapes as they can into juice. Teams who siphon off the most juice will advance to the finals, where they will stomp an incredible 60 pounds of grapes before being named the 2018 Grape Stomping champions! Celebrating its 22nd year, family and friends gather for the spectacular Wine Capital of Canada Festival Weekend to celebrate the region’s cornucopia of food and wine. On September 29, the third annual Oliver Cask & Keg showcases the best craft breweries, cideries and distilleries from Okanagan, Similkameen and Boundary Country. Throughout the evening Canadian band “Cousin Harley” will have people dancing to their high-energy rockabilly music while enjoying dishes from local food trucks. Tickets are available online at www.olivercaskandkeg.ca (early bird $20 until September 14 and $25 after). The event is restricted to 19 and over. The following day, Festival of the Grape shifts the focus to wine in what has become Oliver’s largest outdoor festival. Over 50 wineries, many from Oliver Osoyoos Wine Country, gather with food trucks and artisans to entertain the 4,000 strong crowd. The family friendly festival will include live music from “Big Easy Funk Ensemble”, a fall art show, interactive kids’ zone, live entertainment and of course, the highlight: a very competitive Grape Stomp. Tickets include a festival entry, souvenir wine glass and three tasting token (early bird $25 until September 14, and $30 after). Next articleNuTone® launches HavenTM, effective protection against all types of mosquito, so you can make the most of the summer!